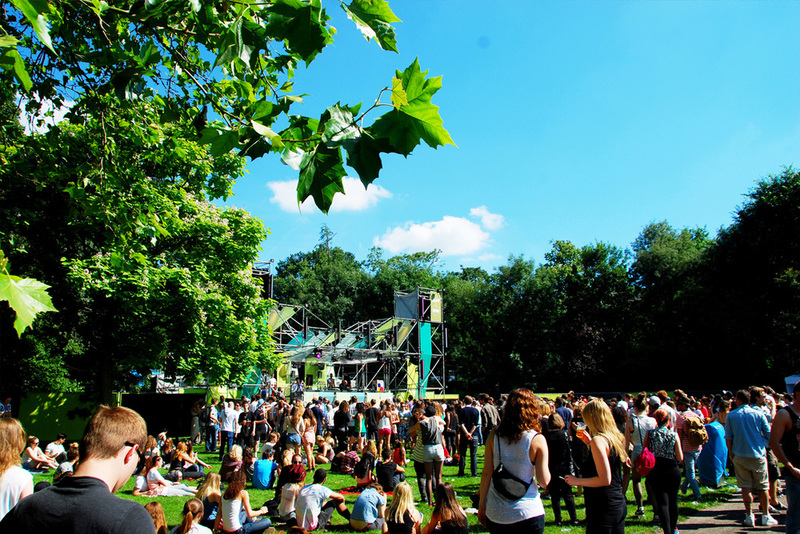 On Sunday July 22nd, the eleventh edition of Appelsap Fresh Music Festival took place in the beautiful Oosterpark in Amsterdam. Since starting out as a free block jam back in 2000, Appelsap has grown into the groundbreaking festival it is today. Its line-up ranges from local talent to the elite of world-class hiphop, soul, R&B and progressive electronic music. Studio Modijefsky was responsible for stage design and giving the festival venue its finishing touches. The design for the festival was based on the Appelsap 2012 Campaign; showing the rebellion ambassadors of Appelsap, carrying flags, torches and setting off fireworks. The concept behind the design of the Electronic stage (hosted by Colors x Boiler Room), the Live Stage and the WeTransfer bridge crossing the pond, was to reflect Appelsaps identity and feel, each in their own unique way. Appelsap flags were intensively used in the designs, varying in shape, adaptation and look & feel. The stage design, which included integrated lighting, along with natural landscapes of the park, strengthened the Fresh Music identity of the Appelsap Festival.